Motto: Пролета̀рии от всѝчки стр��нѝ, съединя̀вайте се! The People's Republic of Bulgaria (PRB; Bulgarian: Народна Република България (НРБ) Narodna Republika Bǎlgariya (NRB)) was the official name of Bulgaria, when it was a socialist republic. The People's Republic of Bulgaria existed from 1946 to 1990 and it was ruled by the Bulgarian Communist Party (BCP), which in turn ruled together with its coalition partner, the Bulgarian Agrarian National Union. Bulgaria was part of Comecon and a member of the Warsaw Pact and was closely allied with the Soviet Union during the Cold War. The Bulgarian resistance movement during World War II deposed the Kingdom of Bulgaria administration in the Bulgarian coup d'état of 1944 which ended the country's alliance with the Axis powers and led to the People's Republic in 1946. The BCP modelled its policies after those of the Soviet Union, transforming the country over the course of a decade from an agrarian peasant society into an industrialized socialist society. 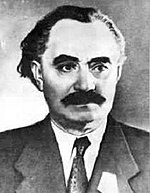 In the mid 1950s and after the death of Stalin, conservative hardliners lost influence and a period of social liberalization and stability followed under Todor Zhivkov. Varying degrees of conservative or liberal influence followed. After a new energy and transportation infrastructure was constructed, by 1960 manufacturing became the dominant sector of the economy and Bulgaria became a major exporter of household goods and later on computer technologies, earning it the nickname of "Silicon Valley of the Eastern Bloc". The country's relatively high productivity levels and high scores on social development rankings made it a model for other socialist countries' administrative policies. In 1989, after a few years of liberal influence, political reforms were initiated and Todor Zhivkov, who had served as head of the party since 1954, was removed from office in a BCP congress. In 1990, under the leadership of Georgi Parvanov the BCP changed its name to the Bulgarian Socialist Party (BSP) and adopted a centre-left political ideology in place of Marxism–Leninism. Following the BSP victory in the 1990 election, which was the first openly contested multi-party election since 1931, the name of the state was changed to the Republic of Bulgaria. Geographically, the People's Republic of Bulgaria had the same borders as present-day Bulgaria and it bordered the Black Sea to the east; Romania to the north; Yugoslavia (via Serbia and Macedonia) to the west and Greece and Turkey to the south. On 1 March 1941, the Kingdom of Bulgaria signed the Tripartite Pact, and officially became a member of the Axis Powers. As a result of the German invasion of Yugoslavia and Greece in April, Bulgaria came to occupy large parts of these countries. In 1942, the Fatherland Front was formed from a mixture of Communists, Socialists and Liberals. In 1944, with the entry of the Red Army in Romania, the Kingdom of Bulgaria changed its alliance and declared neutrality. On 5 September, the Soviet Union declared war on the kingdom and three days later the Red Army entered north-eastern Bulgaria, prompting the government to declare support in order to minimise military conflict. On 9 September, communist partisans launched a coup d'état which de facto ended the rule of the Bulgarian monarchy and its administration, after which a new government assumed power led by the Fatherland Front (FF), which itself was led by the Bulgarian Communist Party. After taking power, the FF formed a coalition under the former ruler Kimon Georgiev, including the Social Democrats and the Agrarians. Under the terms of the peace settlement, Bulgaria was allowed to keep Southern Dobruja, but formally renounced all claims to Greek and Yugoslav territory. 150,000 Bulgarians settled during the occupation were expelled from Western Thrace. The Communists deliberately took a minor role in the new government at first, while the Soviet representatives held the real power. A Communist-controlled People's Militia was set up, which harassed and intimidated non-Communist parties. On 1 February 1945, Regent Prince Kiril, former Prime Minister Bogdan Filov, and hundreds of other officials of the kingdom were arrested on charges of war crimes. By June, Kirill and the other Regents, twenty-two former ministers, and many others had been executed. The new government began to arrest Nazi collaborators. As the war came to a halt, the government expanded its campaign of political revolution to attack economic elites in banking and private business. This strengthened when it became apparent that the United States and United Kingdom had little interest in Bulgaria. In November 1945, Communist Party leader Georgi Dimitrov returned to Bulgaria after 22 years in exile. He made a truculent speech that rejected cooperation with opposition groups. Elections held a few weeks later resulted in a large majority for the Fatherland Front. In September 1946, the monarchy was abolished by plebiscite, which resulted in 95.6 percent voting in favour of a republic, and young Tsar Simeon II was sent into exile. The Communists openly took power, and Bulgaria was declared a People's Republic. Vasil Kolarov, the number-three man in the party, became President. Over the next year, the Communists consolidated their hold on power. Elections for a constituent assembly in October 1946 gave the Communists a majority. A month later, Dimitrov became prime minister. The Agrarians refused to co-operate with the authorities, and in June 1947 their leader Nikola Petkov was arrested. Despite strong international protests he was executed in September. This marked the establishment of a Communist establishment in Bulgaria. In December 1947, the constituent assembly ratified a new constitution for the republic, referred to as the "Dimitrov Constitution". The constitution was drafted with the help of Soviet jurists using the 1936 Soviet Constitution as a model. By 1948, the remaining opposition parties were either realigned or dissolved; the Social Democrats merged with the Communists, while the Agrarian Union became a loyal partner of the Communists. During 1948–1949, Orthodox, Muslim, Protestant and Roman Catholic religious organizations were restrained or banned. The Orthodox Church of Bulgaria continued functioning but never regained the influence it held under the monarchy; many high roles within the church were assumed by communist functionaries. Dimitrov died in 1949 and for a time Bulgaria adopted collective leadership. Vulko Chervenkov led the Communist Party and Vasil Kolarov was prime minister. This broke down a year later, when Kolarov died and Chervenkov added prime minister to his titles. Chervenkov started a process of rapid industrialization modelled after the Soviet industrialisation led by Stalin in the 1930s. Agriculture was collectivised by mandate and refusal to comply was punishable by imprisonment. Labor camps were set up and at the height of the campaign housed about 100,000 people. Thousands of people were charged with treason or participating in counter-revolutionary conspiracy and sentenced to either death or life in prison. Chervenkov's support base even in the Communist Party was too narrow for him to survive long once his patron Stalin was gone. In March 1954, a year after Stalin's death, Chervenkov was deposed as Party Secretary with the approval of the new leadership in Moscow and replaced by Todor Zhivkov. Chervenkov stayed on as Prime Minister until April 1956, when he was finally dismissed and replaced by Anton Yugov. The highest estimate for the number of partisans at any one time in Bulgaria is 18,000. The government used force, threats and intimidation, branding opponents of the policy as fascists and chauvinists. Some were resettled as far as Vojvodina after they had been resettled from Pirin to SR Macedonia for unsuccessful Macedonisation. Bulgaria adopted the Communist policy of closer rapprochement with Yugoslavia. Then Dimitrov, initiated the idea of a Balkan Federation that would range from Pirin to the Shar Mountains and reflect a Macedonian consciousness. For this purpose, he launched a policy of forced Macedonisation of the Bulgarian population in the Pirin region through conscious change of ethnic self-determination, held by means of administrative coercion and intensive propaganda. In December 1946, he conducted a census in Pirin. State authorities instructed the local population in the Pirin region to mark administrative records such as "Macedonian", including Pomaks, with the exception of those originating within the country. At its meeting on December 21, the Regional Committee of the Workers' Party in Upper Cuma decided to accept a formula indicating 70% of residents were "Macedonians". As a result, among the 281,015 inhabitants, 169,444 were identified as ethnic Macedonians. In 1947 Bulgaria and Yugoslavia signed agreements whereby Pirin Macedonia became part of federal Yugoslavia, which proceeded to unify Pirin Macedonia with Vardar Macedonia and abolished visa regimes and removed customs services. Shortly thereafter - in 1948, due to the rupture in relations between Tito and Stalin, the contract was dissolved. For a while BCP and the Bulgarian state held contradictory, protivobalgarska policy on the Macedonian issue. In 1963 at the March Plenum of the Central Committee of the Communist Party, Zhivkov declared that the population in Pirin Macedonia was part of Bulgaria that was forced by the Communist Party. Zhivkov became the leader of the BCP and remained for the following 33 years. The BCP retained its alliance with the Communist Party of the Soviet Union (CPSU), then led by Nikita Khrushchev. With conservative hardliners pushed aside, this brought in a period of liberal influence and reform. Relations were restored with Yugoslavia, which had previously been shunned by the Soviet Union due to its anti-Stalinist stance, and Greece. The trials and executions of Traicho Kostov and other "Titoists" (though not of Nikola Petkov and other non-Communist victims of the 1947 purges) were officially denounced. The party's militant anti-clericalism was relaxed and the Orthodox Church was no longer targeted. Upheavals in Poland and Hungary in 1956 did not spread to Bulgaria. The Party placed firm restrictions on publicising views considered to be anti-socialist or seditious. In the 1960s some economic reforms were adopted, which allowed the free sale of production that exceeded planned amounts. The country became the most popular tourist destination for people in the Eastern Bloc. Bulgaria produced commodities such as cigarettes and chocolate, which were hard to obtain in other socialist countries. Yugov retired in 1962, and Zhivkov consequently became Prime Minister as well as Party Secretary. He survived the Soviet leadership transition from Khrushchev to Brezhnev in 1964. In 1960, when Bulgaria could not pay its debts of $97 million to Western banks, Zhivkov personally addressed a written proposal to Khrushchev asking the USSR to purchase reserves gained over 66 years - from liberation in 1878 to 1944, including 22 tons of gold and 50 tons of silver. The gold was taken to Novosibirsk, where it was further refined and purchased for $35.10 per ounce, a total of 23 million dollars. In 2009, the value of that gold would be $639 million. In subsequent years Zhivkov conducted several secret operations with gold. Between 1960 and 1964 he sold 31.8 tons, using the proceeds to repay Bulgaria's debts mainly to Soviet banks. On 4 December 1963, Zhivkov proposed closer approximation and future merger of Bulgaria and the Soviet Union at the Central Committee plenum. This would make it the 16th Republic of the Soviet Union. The plenum unanimously approved Zhivkov's proposal. In 1968 Zhivkov again demonstrated his loyalty to the Soviet Union by taking a formal part in the Warsaw Pact invasion of Czechoslovakia. His troops entered the country but did not take an active part in crushing the Prague Spring. At this point Bulgaria became generally regarded as the Soviet Union's most loyal Eastern European ally. The operation involved the 12th and 22nd Infantry Regiments numbering 2,164 people and a T-34 tank battalion with 26 machines. Declassified documents of the Communist Bulgaria revealed a plan to foment crisis between Turkey and Greece in 1971. The operation codenamed "Cross" and the plan was that Bulgarian secret agents would set fire on the Ecumenical Patriarchate of Constantinople and make it look like the work of Turks. The declassified documents state that “An intervention” in the religious entity would have “significantly damage[d] Turkish-Greek relations and force[d] the United States to choose one side in the ensuing crisis,”. In addition, the Bulgarians also planned to boost the effect of its operation against Greece and Turkey by conducting “active measures" “for putting the enemy in a position of delusion." The plan was developed by the 7th Department of the First Main Directorate of the DS (intelligence and secret police services of communist Bulgaria), and was affirmed by Deputy Head of the Directorate on November 16, 1970, and approved by its Head. The operation was supposed to be prepared by the middle of 1971 and then executed, but it was abandoned. In 1971 the new "Zhivkovskata" Constitution added so-called. "Article 1", which grants the PA as the sole ruling a "leading force of society and the state." Zhivkov was promoted to Head of State (Chairman of the State Council) and Stanko Todorov became Prime Minister. Bulgaria signed the Helsinki Accords in 1975, which guaranteed human rights and fundamental freedoms, including freedom of movement, contacts, information, culture and education, right to work, and the rights to education and medical care. However, subsequent events regarding Bulgarian Turks in the 1980s were a direct violation of these commitments. In 1978, Bulgaria attracted international attention when dissident writer Georgi Markov was accosted on a London street by a stranger who rammed his leg with the tip of an umbrella. Markov died shortly afterwards of ricin poisoning. He was the victim of the Bulgarian secret service, as confirmed by KGB documents revealing that they had jointly planned the operation with Bulgaria. The Bulgarian People's Army sided with the Soviet Union and the Afghan communists during the Soviet–Afghan War in Afghanistan fighting the jihadist guerrillas from 1982 until its withdrawal in 1989. By the 1980s, the conservatives controlled the government. Some social and cultural liberalization and progress was led by Lyudmila Zhivkova, Todor's daughter, who became a source of strong disapproval and annoyance to the Communist Party due to her unorthodox lifestyle that included the practicing of Eastern religions. She died in 1981, approaching her 39th birthday. A campaign of forced assimilation against the ethnic Turkish minority, who were forbidden to speak the Turkish language and were forced to adopt Bulgarian names took place in the winter of 1984. The issue strained Bulgaria's economic relations with the West. The 1989 expulsion of Turks from Bulgaria caused a significant drop in agricultural production in the southern regions due to the loss of around 300,000 workers. In the late 1980s, the Communists, like their leader, had grown too feeble to resist the demand for change. Liberal outcry at the breakup of an environmental demonstration in Sofia in October 1989 broadened into a general campaign for political reform. More moderate elements in the Communist leadership reacted by deposing Zhivkov and replacing him with foreign minister Petar Mladenov on November 10, 1989. This move gained a short respite for the Communist Party and prevented revolutionary change. Mladenov promised to open up the regime, stating that he supported multi-party elections. Demonstrations throughout the country led Mladenov to announce that the Communist Party would cede its monopoly over the political system. On January 15, 1990, the National Assembly formally amended the legal code to abolish the Communist Party's "leading role". In June 1990, the first multi-party elections since 1939 were held. Finally on 15 November 1990, the 7th Grand National Assembly voted to change the country's name to the Republic of Bulgaria and removed the Communist state emblem from the national flag. It is estimated that between 50,000 and 100,000 people were killed in Bulgaria beginning in 1944 as part of agricultural collectivisation and political repression, although documentation is insufficient for a definitive judgement. According to one source, some 31,000 people were reported killed under the regime between 1944 and 1989. Figures for fatalities in forced labour camps also remain elusive. A 2009 poll conducted by the Pew Global Attitudes Project found that one-in-nine Bulgarians believe ordinary people are better off as a result of the transition to capitalism. Sixteen percent say the multi-party republic is run for the benefit of all people. The People's Republic of Bulgaria was a one-party Communist state. The Bulgarian Communist Party created an extensive nomenklatura on each organizational level. The constitution was changed several times, with the Zhivkov Constitution lasting the longest. According to article 1, "The People's Republic of Bulgaria is a socialist state, headed by the working people of the village and the city. The leading force in society and politics is the Bulgarian Communist Party". The PRB functioned as a one-party people's republic, with People's Committees representing local governance. Their role was to exercise Party decisions in their respective areas and to otherwise defer to popular opinion in decision-making. In the late 1980s, the BCP had an estimated peak of 1,000,000 members—more than 10% of the population. In 1946, the military rapidly adopted a Soviet military doctrine and organization. The country received large amounts of Soviet weaponry, and eventually established a domestic military vehicle production capability. By the year 1988, the Bulgarian People's Army (Българска народна армия) numbered 152,000 men, serving in four different branches - Land Forces, Navy, Air and Air Defense Forces, and Missile Forces. The BPA operated an impressive amount of equipment for the country's size - 3,000 tanks, 2,000 armored vehicles, 2,500 large caliber artillery systems, over 500 combat aircraft, 33 combat vessels, as well as 67 Scud missile launchers, 24 SS-23 launchers and dozens of FROG-7 artillery rocket launchers. The PRB adopted a centrally planned economy, similar to those in other COMECON states. In the mid-1940s, when collectivisation began, Bulgaria was a primarily agrarian state, with some 80% of its population located in rural areas. Production facilities of all sectors were rapidly nationalised. Chervenkov finally ended all private economic activity. Bulgarian agricultural productivity increased rapidly after collectivisation. Large-scale mechanisation resulted in an immense growth in labour productivity. Government subsidies covered the large losses from the artificially low consumer prices. Chervenkov's Stalinist policy led to a massive industrialisation and development of the energy sector, which remained one of Bulgaria's most advanced economic sectors. His rule lasted from 1950 to 1956, and saw the construction of dozens of dams and hydroelectric powerplants, chemical works, the Elatsite gold and copper mine and many others. The war-time coupon system was abolished, and healthcare and education were government provided. All this was achieved with strict government control and organization. Labor came from prisoner brigades and the Bulgarian Brigadier Movement - a youth labor movement where young people worked on construction projects. Vitosha, the first Bulgarian-made computer, as the People's Republic of Bulgaria was a major producer of electronics and computers, thus receiving the nickname "Silicon Valley of the Eastern Bloc"
Bulgaria was involved in computer construction, which earned it the nickname "Silicon Valley of the Eastern Bloc." Bulgarian engineers developed the first Bulgarian computer, the Vitosha, as well as the Pravetz computers. Bulgaria is currently the only Balkan Country to operate a supercomputer, an IBM Blue Gene/P. In the 1960s, Zhivkov introduced reforms that had a positive effect on the country's economy. He put emphasis on light industry, agriculture, tourism, as well as on Information Technology in the 1970s and the 1980s. Surplus agricultural production could be sold freely, prices were lowered even more, and new equipment for light industrial production was imported. Bulgaria became the first Communist country to purchase a license from Coca-Cola in 1965. Despite relative stability, the economy shared the same drawbacks of other countries from Eastern Europe - it traded almost entirely with the Soviet Union (more than 60%) and planners did not take into account whether there were markets for the goods produced. This resulted in surpluses of certain products, while other commodities were in deficit. The other main trade partners were East Germany and Czechoslovakia, while countries such as Mongolia and various African countries were also large-scale importers of Bulgarian goods. The country enjoyed good trade relations with various non-Communist countries, most notably West Germany and Italy. In order to combat the low quality of many goods, a comprehensive State standard system was introduced in 1970, which included strict quality requirements for all sorts of products, machines and buildings. PRB had an average GDP per capita for an Eastern Bloc country. Average purchasing power was one of the lowest in the Eastern Bloc, mostly due to the larger availability of commodities than in other socialist countries. Workers employed abroad often received higher payments, thus could afford a wider range of goods to purchase. According to official figures, in 1988 100 out of 100 households had a television set, 95 out of 100 had a radio, 96 out of 100 had a refrigerator and 40 out of 100 had an automobile. Since 1965, Renault and Fiat chose Bulgaria to site their factories to make automobiles for sale in the Eastern Bloc partnership. Bulgarrenault started in 1966 until 1971 making cars based on Renault 8 and Renault 10. The factories were in Plovdiv. In the end around 6500 cars were produced. The Bulgarian version of Alpine A110 was also made under the marque Bulgaralpine. In 1967, Pirin-Fiat built around 730 cars until 1971 from the models Fiat 850 and Fiat 124. In 1968 a contract was signed between the Bulgarian government and Moskvitch for building Moskvitch 408 and later Moskvitch 2141 (from which around 12,000 cars were produced by 1990). Culture in PRB was strictly regulated by the government, although there were some periods of liberalization (meaning entrance in Bulgaria of Western literature, music, etc.). The thaw in intellectual life had continued from 1951 until the middle of the decade. Chervenkov's resignation and the literary and cultural flowering in the Soviet Union created expectations that the process would continue, but the Hungarian revolution of fall 1956 ended the experiment. Chervenkov was appointed minister of education and culture. In 1957 and 1958 he purged the leadership of the Bulgarian Writers' Union and dismissed liberal journalists and editors from their positions. His crackdowns effectively ended the "Bulgarian thaw" of independent writers and artists inspired by Khrushchev's 1956 speech against Stalinism. ^ a b Hanna Arendt Centre in Sofia, with Dinyu Sharlanov and Venelin I. Ganev. Crimes Committed by the Communist Regime in Bulgaria. Country report. "Crimes of the Communist Regimes" Conference. 24–26 February 2010, Prague. ^ Valentino, Benjamin A. (14 January 2013). Final Solutions: Mass Killing and Genocide in the 20th Century. Cornell University Press. pp. 91–151. ISBN 0-8014-6717-9. ^ Rummel, Rudolph J. (1998). Statistics of Democide: Genocide and Mass Murder Since 1900. LIT Verlag Münster. ISBN 978-3-8258-4010-5. ^ Poulton, Hugh (2000). Who are the Macedonians?. Indiana University Press. ISBN 978-0-253-21359-4. ^ "TROOPS OF 5 SOVIET ALLIES REPORTED FIGHTING GUERILLAS IN AFGHANISTAN". The New York Times. 20 December 1982. Retrieved 16 October 2017. ^ "1990 CIA World Factbook". Central Intelligence Agency. Retrieved 7 February 2010. ^ "UK Home Office Immigration and Nationality Directorate Country Assessment - Bulgaria". United Kingdom Home Office. 1 March 1999. Archived from the original on 15 September 2012. Retrieved 2011-11-14. ^ Шарланов, Диню. История на комунизма в България: Комунизирането на България. Сиела, 2009. ISBN 978-954-28-0543-4. ^ Todorov, Tzvetan (1 November 2010). Voices from the Gulag: Life and Death in Communist Bulgaria. Penn State Press. pp. 38–42. ISBN 0-271-03883-7. ^ "An experiment in living socialism: Bulgaria then and now » pa". politicalaffairs.net. Retrieved 2016-09-29. ^ "Bulgaria - Military Personnel". Lcweb2.loc.gov. Retrieved 15 October 2017. ^ a b Wolff, Robert Lee (1967). The Balkans in our Time. Cambridge. Massachusetts: Harvard University Press. p. 343. ^ "Agricultural policies in Bulgaria in post Second World War years" (PDF). Mpra.ub.uni-muenchen.de. p. 5. Retrieved 16 October 2017. ^ "Bulgaria: Soviet Silicon Valley Revived". Novinite.com. Sofia News Agency. Retrieved 1 April 2014. ^ "Living Standards". Lcweb2.loc.gov. Retrieved 15 October 2017. ^ Teichova, Alice; Matis, Herbert (2003). Nation, State, and the Economy in History. Cambridge University Press. p. 138. ISBN 0-521-79278-9. Wikimedia Commons has media related to People's Republic of Bulgaria. "Bulgarian Trade with Developed Non-Communist Countries". 2012-02-26. Archived from the original on 2012-02-26. Retrieved 2017-07-06.